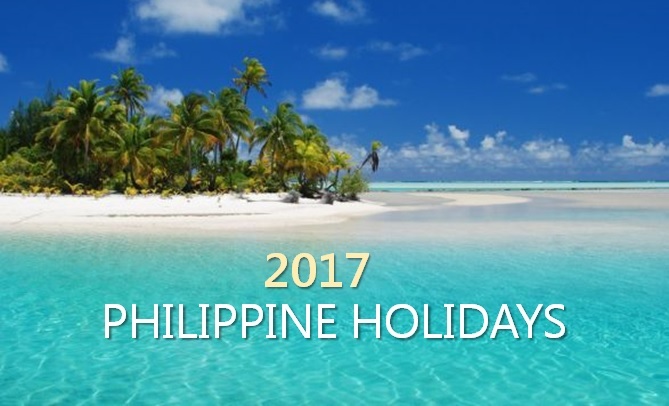 MANILA, Philippines - (Updated June 16, 2017) The Malacañang Palace on Thursday, August 18, has released the full list of regular holidays and special (non-working) days for the year 2017. Through Proclamation No. 50, President Rodrigo Roa Duterte has declared 10 regular holidays and at least 7 special days to be observed nationwide. Duterte added October 31 as special non-working day to strengthen family ties by providing more time for the traditional All Saint's Day commemorative activities and to promote domestic tourism as well. Chinese New Year and the EDSA People Power Revolution Anniversary were also justified in the proclamation. "Chinese New Year, which is one of the most revered and festive events celebrated not only in China but also in the Philippines, and such date may be declared as a special non-working day without detriment to public interest." "Whereas on 25 February 2017, the country will commemorate the 31st anniversary of the EDSA People Power Revolution, which restored and ushered political, social and economic reforms in the country." The Department of Labor and Employment (DOLE) was assigned to have implementing guidelines for the proclamation. If the employee did not work, he/she shall be paid 100 percent of his/her salary for that day. Sample computation: Daily rate + Cost of Living Allowance x 100 percent. The COLA is included in the computation of holiday pay. If the employee worked, he/she shall be paid 200 percent of his/her regular salary for that day for the first eight hours. Sample computation: Daily rate + COLA x 200 percent. The COLA is also included in computation of holiday pay. If the employee worked in excess of eight hours (overtime work), he/she shall be paid an additional 30 percent of his/her hourly rate on said day. Sample computation: Hourly rate of the basic daily wage x 200 percent x 130 percent x number of hours worked. If the employee worked during a regular holiday that also falls on his/her rest day, he/she shall be paid an additional 30 percent of his/her daily rate of 200 percent. Sample computation: [(Daily rate + COLA) x 200 percent)] + 30 percent Daily rate x 200 percent. If the employee worked in excess of eight hours (overtime work) during a regular holiday that also falls on his/her rest day, he/she shall be paid an additional 30 percent of his/her hourly rate on said day. Sample computation: Hourly rate of the basic daily wage x 200 percent x 130 percent x 130 percent x number of hours worked. If the employee did not work, the “no work, no pay” principle shall apply, unless there is a favourable company policy, practice, or collective bargaining agreement (CBA) granting payment on a special day. If the employee worked, he/she shall be paid an additional 30 percent of his/her daily rate on the first eight hours of work. Sample computation: (Daily rate x 130 percent) + COLA). If the employee worked in excess of eight hours (overtime work), he/she shall be paid an additional 30 percent of his/her hourly rate on said day. Sample computation: Hourly rate of the basic daily wage x 130 percent x 130 percent x number of hours worked. If the employee worked during a special day that also falls on his/her rest day, he/she shall be paid an additional fifty percent of his/her daily rate on the first eight hours of work. Sample computation: (Daily rate x 150 percent) + COLA. If the employee worked in excess of eight hours (overtime work) during a special day that also falls on his/her rest day, he/she shall be paid an additional 30 percent of his/her hourly rate on said day. Sample computation: Hourly rate of the basic daily wage x 150 percent x 130 percent x number of hours worked.